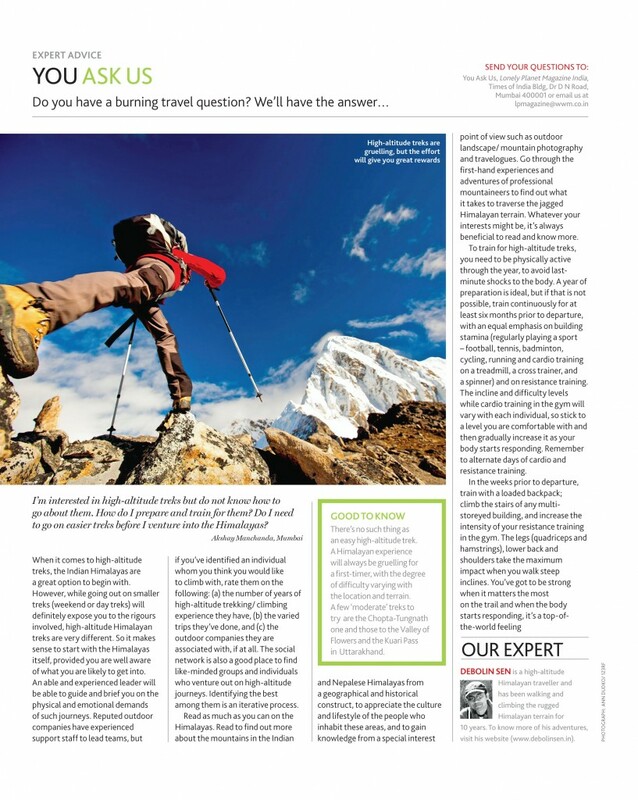 Article in Lonely Planet Magazine India. June 2014. 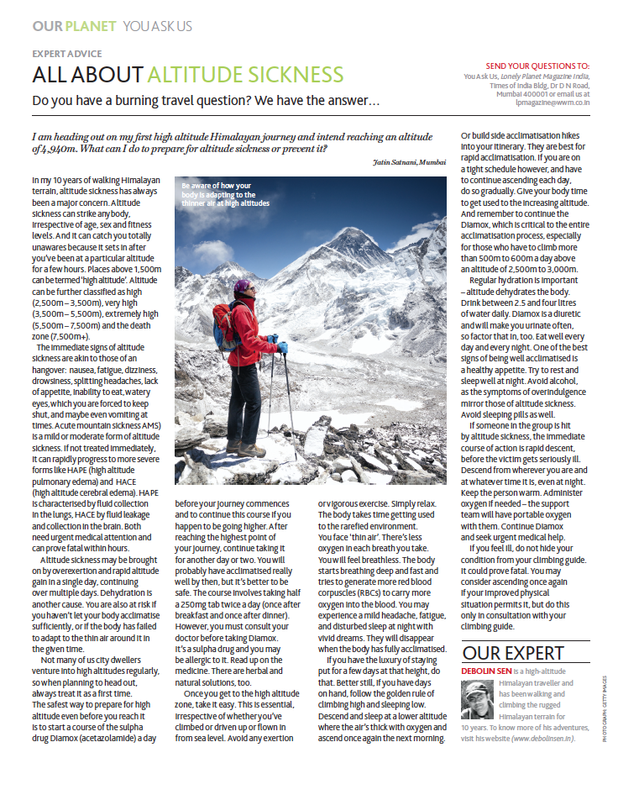 Article in Lonely Planet Magazine India. Dec 2013. Now that the story’s been told of what I went through while reaching the summit of Stok Kangri 6153 mtrs/ 20187 ft, the focus shifts on the core gear which took me to the top. Without them, the summit would have been out of reach. I have always been extremely selective and mindful of the gear I carry and usually veer towards the best available. Having said that here are short reviews on some of them. We started crossing the glacier in a single file, maintaining steady progress. I knew there would be two crevasses we had to navigate. Small ones both were, so they really weren’t a concern. The mountain looked gigantic now and yet seemed halved. We had pretty soon reached the base of the south face we were to ascend. Up and up the trail went and we just kept following it, taking breaks in between whenever we had to. On most of the ascent, the inclines ranged between 40 to 50 degrees. It would have been around 2.15 or 2.30am when Ketan started feeling drowsy and couldn’t keep up with the pace set. He wanted to sit back and sleep, a most dangerous thing to do on a steep face. The immediate risks would be the body cooling down and the cold settling in besides the dangers of loose rocks which could roll off the face. It was dark and if this were to happen, we would have no prior warning. Rocks tumbling down can be a nightmare during an ascent and can knock climbers down a face. Eventually we did halt and Ketan did exactly what we had feared he would. For a handful of seconds which seemed rather long to the rest of us, he sat down, closed his eyes and rocked his head back. He hadn’t slept well for two nights and the exhaustion had finally overtaken him. Kalpak and I kept urging and encouraging him to wake up. The continuous chatter was important to keep the morale high and not let sagging spirits overcome the mind. Chain Singh, meantime offered him tea which he had carried. It made a difference and Ketan soon regained his composure. We were ready to climb again. “Ok. Debolin. It’s time for you to pack your bags, head to Stok Village and the hotel in Leh. I’ll be sending a porter with you. Be safe and await our return. We won’t be longer than tomorrow evening”. “But I’ve just reached Base Camp. It’s hardly been half an hour. I can’t go down now. Not yet”. With a heavy heart, I gathered my bags. The world had seemingly crashed around me. I didn’t make eye contact with the rest of the team and trudged out of base camp to the shouts of farewell. I didn’t turn around either to say goodbye. I just kept walking. I wanted to stay back and experience a night at base camp. My summit dreams were over and I wasn’t even asking for that. And yet the team leader’s decision had to be adhered to. I had been viciously hit by altitude during the journey and I suppose he was right. I reached the hotel at Leh just after lunch and waited. From the hotel’s porch I shifted my gaze to the peak in the horizon. I don’t know what came over me that moment but subconsciously I promised myself I would see the world’s highest mountains over the next many years and would come back to summit this peak one day. The year was 2003. I have grown into a keen collector of adventure gear. The experience has its own thrills and highs that only a collector of such products can understand. Over the last 10 years, I have been at it, making multiple visits to stores in India and abroad, whenever I’ve had the opportunity. Most of what I’ve purchased continue protecting me well, even now, when I head to the Himalayas. Amongst them, my prized possessions are my shoes and jackets. This year, as I get ready to embark on yet another journey, I am elated that I have a complete new set of gear which I will be taking along. And well, testing them on the trail! The tests will be for the well known American outdoor brand Merrell (http://www.merrell.com/US/en). It’s a special opportunity this, as also the year/ month that I am doing it in. I complete 10 years in the outdoors and the Himalayas this month. And when I look back, I really didn’t think then, that I would keep going and going and… . These 10 years have been immensely adventurous.